So, plans are underway, for a return to the UK, for me and maybe the rest of the clan if projects become more long term. I have a photo assigment scheduled at the start of April for a couple of days, then may leave for the UK from mid April for at least a few weeks, to start rehearsing, do some more recording and to put some finishing touches to the album, which I hope we’ll finally get out in May. With ice hockey being the national madness, most Canadians can skate. Having been here for nearly 3 years, we’ve been practising…. Up at the local rink, Mt. Boucherie, every Sunday there is a public skating session. Needless to say, with nothing else on the schedule, we’ve been up there for the last couple of weeks. Sam’s been skating like a pro from nearly day one, well, winter #1 anyway, but the rest of us have been poor in our up take. Holly had one lesson and then broke her arm, but she’s been a couple of times with her school and has mastered it, getting better each time we go. I’ve got it down to a fine art…. I say art, as in broad smudges, as opposed to delicate brush strokes! Even Leigh has managed to get herself into the middle of the rink at todays attempt. Don’t think I, or Leigh are going to be entering for the Winter Olympics anytime soon, but at least we’ve finally got our skates on, literally. Mine I’ve had from our first Xmas, and only just used ’em! In Concert, with Norman Foote…. 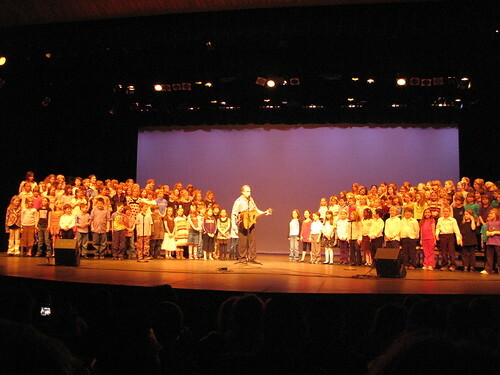 On Friday night, Holly was part of the choir, in a concert with Norman Foote…. They sang for about an hour, along with Norman, the usual fun songs that kids love to sing, with him doing a quick skit with a baby dummy, a baby’s cot, a dirty nappy which he proceeded to throw at the screaming kids along with a water pistol in the cot, making the kids think the baby was pee-ing on him, and then everyone in teh choir (…along with the people in the front row. It had some reach!). Sam, needless to say was screaming in hysterics!!! So, all in all, a good concert, he had the kids under control, amazingly, with them all singing in time at the right places and the whole thing was a lot more fun than we were expecting.